Mineral oil and vegetable oil have different properties and uses. Vegetable oil comes from plants, whereas mineral oil is a petroleum derivative. Mineral oil is used primarily in cosmetics and as a laxative; vegetable oil is used mainly in cooking. Both oils have miscellaneous household uses. Mineral oil, a byproduct of crude-oil processing, is a common ingredient in many cosmetic products, including skin moisturizers and makeup. It is commonly used as a lubricant in industrial applications, such as oiling heavy machinery. Mineral oil contains no nutritional value, but it can be tolerated in small doses when used medicinally as a laxative. For the treatment of constipation, mineral oil can be taken orally on an empty stomach or as a rectal enema at bedtime. Mineral oil blocks the body's absorption of certain nutrients, however, and can lead to vitamin deficiencies if taken for longer than a week. Vegetable oil is a food ingredient used in cooking. It usually is not used for applications other than cooking, as it can spoil. There are many types of vegetable oils with different nutritional profiles and food applications. Common varieties of vegetable oil include corn, soybean, peanut, olive and canola oils. Nutritionally, the healthiest vegetable oils are not hydrogenated and contain more unsaturated fats than saturated fats. 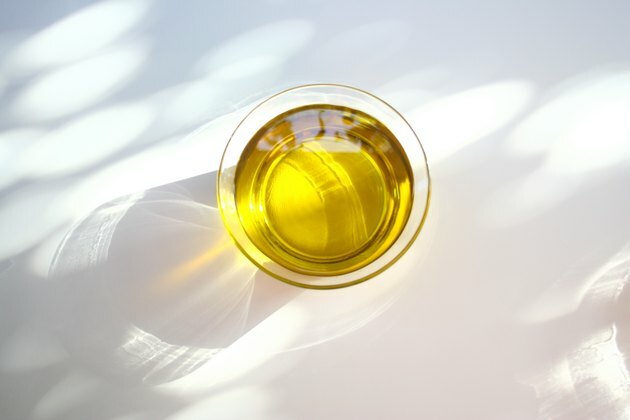 Healthier vegetable oils include flax, olive and canola oils. Less-healthy vegetable oils include palm kernel, coconut and cottonseed oils. Mineral oil and vegetable oil can each be used in certain household applications. Mineral oil can be used to season a butcher block, oil clay poker chips or coat shaving razors to prolong their useful life. It can also be applied directly to the skin as a moisturizer. Vegetable oil can be used to season cast iron cookware, remove labels and stickers from plastic and glass, keep mosquitoes out of a bird bath and to soften rough skin, although you may find the smell disagreeable. Vegetable oil derived from flaxseed may be used as a gentle laxative. While mineral oil can be taken orally in small amounts as a laxative, it is not otherwise edible and cannot be used in cooking. Furthermore, mineral oil may not be the safest or most effective laxative for everyone. If constipation is caused by a stomach disease or a blocked intestine, mineral oil may make constipation worse, according to the American Cancer Society. Besides blocking the body's absorption of nutrients, mineral oil may interact with certain medications. For these reasons, talk to your doctor before taking mineral oil to relieve constipation. According to website AskDrSears.com, flaxseed oil is a safe alternative to mineral oil; it has laxative properties but also provides nutrition and facilitates your body's absorption of other nutrients.